This quilt was pieced by Sarah Turnage of San Francisco and quilted by Mary Thompson and Aurelia Forester. There is so much motion in this quilt that it borders on optical illusion! The first thing Eli brings to my attention are the two bright reds in the center of the quilt that create a medallion of sorts. They hold the center of the quilt and are flanked by subtle borders. Notice how the thick brown strip that runs across four blocks the top plays off the skinnier brown strip in the bottom right that runs across two blocks. These constitute a top and bottom frame, or inner border around the reds in the center. The left border is delineated by a subtle shift of color and scale or rhythm of the blocks. The outer right border is made with strips of solids on the edge that lead to an outer bordered edge of pink on the bottom right. Notice how there isn't any white in the blocks bordering the quilt. All the white is contained in the center blocks. This also delineates a sense of the borders. Eli notes the variable strip widths. Most of the strips and squares are cut evenly but there are a few that are cut wider on one end than the other, these slight irregularities add to the quilt. The block pattern is a quarter log cabin. Eli believes that the quarter log cabin is unique to the African-American tradition of quilting. He could find no record of this block pattern originating from the Euro-American tradition. It is NOT made by making a log cabin block and cutting it into quarters. Each quarter log cabin block in this quilt was made individually -- no two alike. Not only is each block unique the way the center squares of the blocks come together is always different. Sometimes two squares meet at a seam, sometimes three, sometimes the square runs into strips. 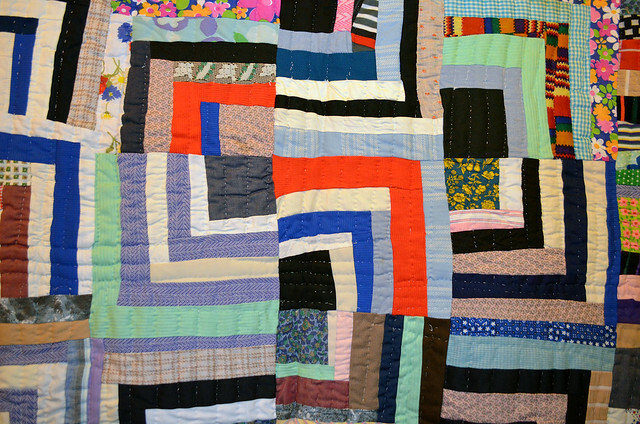 Notice how Sarah uses solids and patterns in this quilt. In the bottom row of the quilt there is a complete mix of fabrics. Eli thinks its undefined. That part of the quilt fades compared to the rest of it. We agree that this is perhaps the weakest section of the quilt, was she trying to do something special or did she just run out of solids? What do you think? Otherwise the interspersing of solids with prints, especially plaids and stripes add to the boldness and optical nature of the quilt. The flower prints seem like filler to Eli, but I think the pink and green and orange flower print is unexpected and works wonderfully. We both love how the plaids and stripes go in different directions. Sarah uses all kinds of fabrics, including polyester. These textures add to the quilt. I love how all the lime green is congregated up at the top. The fact that it is not scattered everywhere is a strong design choice. I also love the quilt's naturally finished shape. Sarah didn't just take a ruler and whack off the edges of the quilt to make a straight edge. Eli insists the name of this quilt is Turkey Breast, because that is how it is listed in some of his notes and in his book, Models of the Mind. However on the tag attached to the quilt Eli listed the name as Turkey Boast. We disputed the name of the quilt for quite a bit. I think Turkey Boast makes sense because the pattern reminds me of a turkey strutting around. Eli insists that his records record the name as Turkey Breast even though he agrees that it doesn't make a bit of sense. We both have a good laugh about the pattern name, but whatever the name it's a spectacular doozy of a quilt. It is unique of its kind. So what do you see? Please join the conversation! 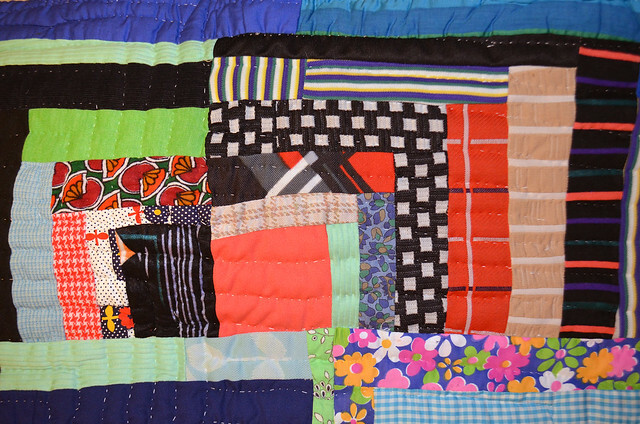 Check out the archive Talking Quilts with Eli Leon for more exclusive insights on improvisational quilts from Eli’s extensive African-American collection.